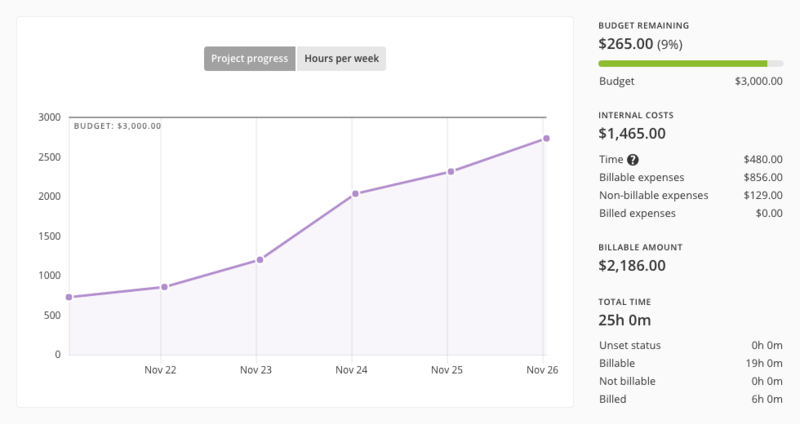 In our last update, we talked about the new Expenses section, a tool for tracking expenses for a project. Keeping tabs with expenses is not the only piece of the puzzle though; to ensure your projects are profitable, you need an accurate project budget too! Starting today, there's a new integrated tool in Apollo to help you achieve that: Budget tracking. Now you can set the budget for a project, calculate its costs (down to the nickle) based on time and expenses, and stay updated on the remaining budget. 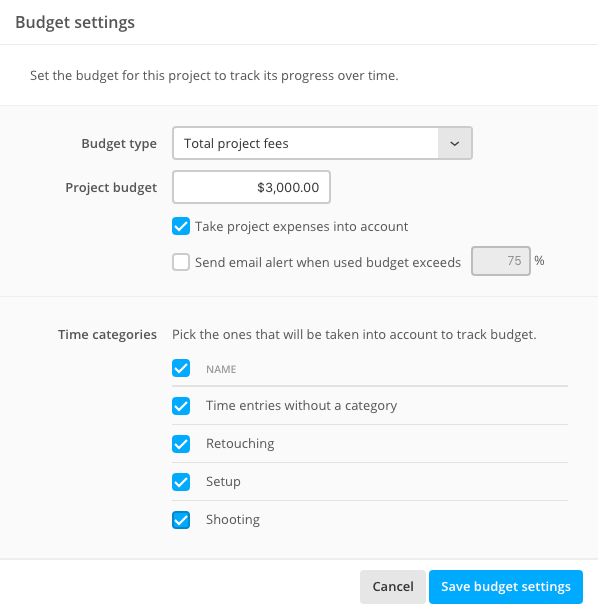 To start, just open a project (even an existing one), click the Budget menu, then click the Budget settings button. There you can decide how the budget should be tracked for that project. Please note: the Budget menu is available only to internal users with the "Can manage projects" permission. We tried to cater to the most common scenarios, from the most simple where there's just a fixed total budget – either as a fixed amount of money or as fixed amount of time – to the more specific cases, where you want to specify the budget per category or per person. Depending on what you set, you might be asked to set the hourly rate for the project, category, or user, which you can do by clicking the Hourly rate settings button. The budget screen also shows the internal cost subtotal, which is the sum of the project expenses and the internal cost of people working on it. The hourly rate for the "Internal cost" section is a different amount that can be set from "User Cost Rates" screen inside Apollo's general settings. Now you're set! Just keep tracking time and expenses, and glance on the chart from time to time to make sure the ship is on its right course! Or, just setup the automatic alert feature to receive a notification when the used budget reaches a specified threshold.